18 templates NEW FOR 2018! 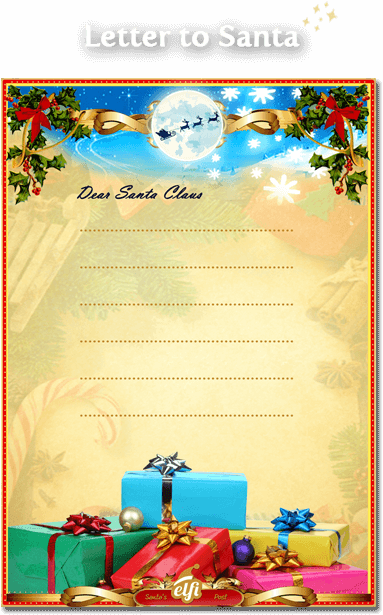 Santa Letter | Download a FREE printable letter from SantaHow to download a FREE letter to Santa? e.g. Dear Peter. Edit the letter freely. Here’s wishing you the best, straight from the far and frozen North! We’re having a great time up here. In our factory, work is in full swing, creating new dolls, teddy bears and rocking horses every day. I cannot wait to finally sit on my magic sleigh, loaded with presents, and go on my journey around the world! Maybe you don’t know, but all these presents are made thanks to my elves. Each of the elves has a unique name and important tasks to perform. For example, Scruffy the Elf. He visits the whole world to check if children clean their rooms. He used to have the same problem, but he decided to change his bad habits after he had taken part in an amazing adventure, in the Forest of Lost Things. Scruffy had gone there to find his lost screw. If you’re good, one day I will tell you the story. Oh, and Fussy the Elf! He’s responsible for making sure that children eat their vegetables and don’t peck at their food. It used to be a great weakness of Fussy. He tried to avoid eating vegetables at every cost and was wriggling in his chair all the time. One day, when he was on a trip to the Forest of Lost Things, he was so hungry that he finally lost all his energy. That day, he finally understood that nothing remedies a lack of energy like a bowl of hot soup. Do you know that Scruffy the Elf and Fussy the Elf visit you very often? To make them even happier, try to eat everything that’s on your plate and keep your room clean and tidy. From time to time you can leave an apple out for them or make a little cardboard house, so they can rest a while after their long journey. Have a truly wonderful winter, and see you soon! PS I hope you will love the gift that I’ve prepared for you. It has now been a year since I last came to your home. How time flies! As you would expect from a good Santa, I have been very busy preparing for my journey this Christmas. I will ride my sleigh for thousands of miles and deliver presents to all the well-behaved children around the world. I don’t want to alarm you, but I nearly wasn’t going to make it this year! You see, some time ago one of my reindeer went missing. Can you guess which one? Yes, that’s right. It was Rudolph! Every day I feed my antlered friends in their enclosure. But one day last week, as I was walking over to their home, I saw that the gate was slightly ajar. I counted up all the reindeer except one – Rudolph. So, I called all the elves together and we began a search for my mischievous friend. It lasted all through the night and all through the day. We had nearly given up hope when, searching the woods and knee-deep in the snow, I finally noticed his sleek silhouette on a nearby hill. It was my little Rudolph! I ran up to him and said, ‘Where have you been!? We’ve all been looking for you!’ My old friend replied that he had been waiting for the first star of the evening to appear in the sky, just as it will on Christmas Eve as a signal to begin our journey. So, in the end, we all returned home safely. The elves carried on packing up the presents and I practised my ‘ho-ho-ho’. When the first star does appear again on 24th December, I will set out in my sleigh, pulled by my brave reindeer. I will visit children just like you, all around the world, and give them the presents they have been dreaming of. Now, the gift that I have prepared for you is a reward for your good behaviour this year! And I hope this gift will encourage you to be a good boy next year too. Last of all, I wish you lots of fun and joy this year and in the year to come. Merry Christmas! I am sure you know that I live in a land of eternal winter. So, the first part of my journey to deliver presents isn’t easy. The reindeer must get me through snowstorms, snowbanks and snowdrifts before I can reach all the children waiting to catch a glimpse of my sleigh. You must be curious about what I am bringing for you this year. I promise you it is something very special that will bring you a lot of joy. All year long, I have heard good things about you. I know that you have studied hard, listened to your parents and helped them through the year. I understand; being good is not that easy. I bet you have already found that out for yourself. But remember that true bravery means overcoming your own weaknesses. If it is hard at first, be persistent and don’t hesitate to ask for help. It makes me glad that you get on well with your friends. I always found that it is better to have one good friend, than ten bad ones. I received a truly beautiful letter from you this year. You wrote to me about your dream presents so I really hope that you will like the gift that my elves have prepared for you. But before you unwrap it, remember that it's not the presents that take you into the world of fantasy and magic, but your own imagination! Keep that in mind. I wish you a fantastically fun holiday and many moments of happiness. Please keep trying to be a good and kind boy, and I’ll see what I can do for you next year too. It has been a while since I last saw you, and now you are a year older! I have heard that you are doing your best to be a good boy. Keep it up and you will get a nice gift from me. Up here, the snow has been falling for months. It already comes up to our waists, so I wear the same warm woollen hat I got when I was a boy, probably the same age as you are now. I am a lot bigger than I was then, so it looks quite funny sitting on top of my head. Well, it puts a smile on the elves when they see it. I remember when I wanted to be a footballer. I would run around with my ball all day long, in the kitchen and the hallway. And from time to time I would hit a clay pot or some china plates. Now that was fun. My granny always told me to be good, but when there was a ball involved, I did not want to listen. I loved scoring goals, but I wasn't very good at it. The ball always landed on the roof of our stable. Then one day, late in the evening, a little gnome knocked on my window. When I let him in out of the cold, he looked up at me and said in a stern voice, 'You have to be good from now on and listen to your granny.’ My eyes went wide as I listened. ‘Every time you tidy up after yourself, I will write a little tick next to your name on the Nice List.' Then he jumped out through the window as quickly as he came. From that day on, I was a good boy. Just imagine my surprise when I found my dream present under the Christmas tree – a new football and kit. I ran to the local playground’s football pitch as quickly as I could to try out the new ball. I kicked it as hard as my little feet could, and scored a perfect goal. I notice four tick marks next to your name so far. A few more would be good. As I look out my window and in through the workshop doors, I can see there is something pretty special waiting for you in the gift pile. If you are a good boy, it will make its way to you in time for Christmas. I am sure that you are counting down the days to Christmas, just like me. I get so busy at this time of year that the days go so quickly. Before I know it, it will be Christmas and I will be flying my sleigh around the world. I receive a lot of letters from children. I tend to lie by the fireplace and eat chocolate while I read them. You might wonder how I manage to make time for the mountain of gifts, the mischievous elves, and energetic reindeer. Let me tell you what Christmas season really looks like up here in Lapland. Each morning, my personal assistant, Horace the Elf, brings me a large box of letters sent by children and adults from all over the world (yes, adults write to me too!). We read through them all very carefully and make notes on various gifts ideas. Sometimes the letters are actually adverts for new models of sleighs. Well, in my opinion my trusty old sleigh is still working perfectly well, both on snow and in the air, so we will not be replacing it anytime soon. After lunch, I always visit my reindeer and the other animals that live with us. Sometimes we visit nearby villages, if the weather is nice, and tell each other funny stories on our way there. When the evening comes, the elves meet me by the fireplace and talk about everything that has happened to us throughout the day. My elves are very chatty. We usually sit around together until all the embers in the fireplace have burnt out, discussing which gift is going to which child. I can imagine your big smile when you find out what a wonderful gift I have for you this year. I hope you like it! Finally, the time you’ve been waiting for this whole year has come – Christmas! A time of happiness, Christmas tree decorating, gingerbread baking, and searching for gifts under the tree. I have also been waiting impatiently for my big day. My heart gets warmer every time I bring happiness to children by giving them presents. However, before you check what’s inside yours, I want to share a little bit of my joy with you. This present is a celebration of your good effort this year. I know how hard is to be a good child sometimes; to help your parents in the house and do what they say. Not to mention doing your homework every day. You’ve achieved your goal despite all the obstacles. Bravo! The run up to Christmas is a chaotic time here, all because of those gifts! Some time ago someone spilled a little bit of magic stardust in the gift-wrapping hall. I wish you could have seen what happened. As I entered the hall to check how many presents were left to prepare, I saw something strange. Some elves were hovering above the floor! Some elves were trying to pull the flying ones down with ribbon lassos; the toys were all stuck to the ceiling; and paper started to wrap itself around gift boxes. There was a terrible mess. Luckily, I had with me an empty golden bag for the stardust. I opened it and the dust politely returned to it in the blink of an eye. Such strange stories, but this kind of thing happens to us from time to time. I take great joy in writing this letter to you my dear. I wanted to tell you how much work it is to put on Christmas. The day is fast approaching, and I keep wondering if I will be ready for my journey. The elves are working at full speed to get everything ready for the big day. Everyone is either wrapping or writing something. So, in order to make sure everything goes well on the day, today I decided to go for a trial ride with my reindeer, to see if they are fully prepared for our trip. I took out our special Christmas harness, made sure all the reindeer were in the right order, took a few bottles of the magic formula, and pushed the sleigh into a meadow near the house. Rudolph was giggling and boasting in front of the other reindeer as usual, but when I shouted: “Let’s go!”, he and his team focused, and heaved the sleigh with their usual determination. First, we went straight ahead into the woods. We travelled past several villages and passed a group of lumberjacks. Their eyes were wide open in disbelief and awe. I was calling out “ho, ho, ho” as always! Those who recovered themselves even replied to me in the same manner, which really made Rudolph laugh. He teased me later by making silly impressions. I used the magic flying formula as soon as we left the woods, and a few seconds later we lifted high into the air, leaving the snow-covered tree tops far below us. By then, all the reindeer were shouting “ho, ho, ho!”, or as close to it as a reindeer can get. We returned home just before the sun set and the sky went dark, and by then I knew that this year's journey would go well. You see, practice makes perfect, and I know that this year our journey will be perfect. I encourage you to keep practising being good. Listen to your parents and be kind to the people you meet and you will get a reward from Santa. We’ll visit you too, so be patient. Christmas is a truly magical time. You must be a little bit surprised to receive a letter from me. I took a break from my mince pies, to write to you personally. My elves have told me a lot of good things about you. It makes me so glad to hear that you have been doing your best to behave well this year. Did you know that some years ago, the elves created a special diary, the Diary of Good Deeds? Every time a child, anywhere in the world, performs a good deed, a note is made next to their name and it stays there forever. When we begin our preparations for Christmas, the elves and I sit in front of the fire to read the diary together and decide which presents each child should get from our workshop. All the gifts are gathered in a special room with cushioned walls. We have thousands of toys in there. Every single toy is looked after by a designated elf, who knows exactly which gift is for which child. Of course, even we make mistakes from time to time. Sometimes we send a slightly different present to what was asked for, but our creations are so marvellous that they always make children smile. Every gift from Lapland is special in its own way. I seem to remember seeing one or two packages with your name attached in the gift room, so I have a good feeling that you'll be very happy this year. I can’t tell you what is inside the wrapping because the elf who is in charge of your gifts keeps everything secret. Be prepared for something amazing! As I sit here at my desk, another snowstorm rages outside my window. It is slowly getting dark, and in the distance I can see a group of my happy elves returning home on their dog-sleds, with the barking of their huskies and jingle of their sleigh bells blending with the sound of the wind. The closer it gets to Christmas, the harder the elves must work. Fortunately, we all help each other, and nobody is left alone with their duties. We sometimes add delicious treats to the presents just to make life sweeter. They are the responsibility of one of our elves – his name is Anastasius. He travels the world and seeks out new recipes for sweet treats. Like yellow cake with chocolate frosting, gingerbread with jam, lollipops of thousands of flavours, Christmas-tree shaped chocolate, and crunchy wafers with peanut cream. He has his own special recipe book, which is already 1000 pages thick! Every year, after he visits a new corner of the world, he adds a few pages to the book. Anastasius has been around for quite some time. Even I don’t know how old he is! All I know is he can entertain us with his stories for hours, even if we have heard them before. They still make us smile every single time he tells them. However, listening to stories are no match for eating the results. It makes Anastasius a little annoyed when we rush to the kitchen before the story is over, but deep in his heart he's happy that his treats bring us so much joy. A little bird told me that you have behaved incredibly well this year, which makes me very happy. One of our elves mentioned your name so many times that it sounds like they must be preparing something very special for you! The days are getting shorter, the nights longer…and colder. I trust that you are wearing your hat and gloves already, just like me. Everybody here has been running around like busy bees to make sure that all the children in the world receive their presents on time. I will prepare something very special for you this year. I am so looking forward to visiting your home again and seeing what has changed. My elves are hard workers. They always keep an ear to the ground, so they can discover what brings the most joy to children. One of the elves even came up with his own fantastic toy idea. He has been making toys from snow! He has already created many of them: snow teddy bears, snow dolls, snow footballs, and other snow toys. Unfortunately, he isn’t always so clever. One evening he put them near the fireplace and all the toys melted in the middle of the room. We were ankle-deep in water and we had to pull up our trouser legs. Only the reindeer didn't seem to be bothered and were grateful for the puddle of indoor drinking water. In Lapland we have these kinds of adventures all the time. Every single day something new happens here, and if you are good, I will tell you a few more of our funny stories. A new bag of letters arrived as I wrote this to you, so I must read them now too, and hear what the world’s children dream of this Christmas. I shall see you soon! It’s been some time since we saw each other last. Back when you used to believe in me. That is, until you had your doubts, and then I suppose someone told you not to believe in me anymore. I bet you felt disappointed when that happened. Don’t worry, I hear it all the time from people your age. But deep down you still hoped I was real, right? Well, I have some good news for you. Right now, you are reading a letter from me, the one and only Santa Claus. You’ll remember that my job is to keep tabs on how good everyone has been each year. Tell me, how often have you looked at your phone today? Are you studying? Watching cat videos? Or are you checking Facebook for the 40th time that day? Don't worry, whatever you think you are missing out on always looks far better in pictures than in reality. Follow my advice and remember: school is important so make sure you get enough sleep. Go to bed early so you can get up early. Plan your day the night before so you can get up and go without rushing. Show the people you care about that you care about them. And finally, help your parents out at home. They take care of you, you can take care of them too. I take notes all through the year, and I appreciate it when you work hard. My dear girl, my elves and I have spent a lot of time choosing a proper gift for you. There is just one last thing to remember. Always say ‘thank you’ for your gifts, and please leave out some carrots for Rudolph. I’m trying to stop him eating so many mince pies. I’ll see you soon! You’ll remember that my job is to keep tabs on how good everyone has been each year. Tell me, how often have you looked at your phone today? Are you studying? Watching cat videos? Or are you checking Facebook for the 40th time? Don't worry, whatever you think you are missing out on always looks far better in pictures than in reality. Follow my advice and remember: school is important so make sure you get enough sleep. Go to bed early so you can get up early. Plan your day the night before so you can get up and go without rushing. Show the people you care about that you care about them. And finally, help your parents out at home. They take care of you, you can take care of them too. I take notes all through the year, and I appreciate it when you work hard. My dear boy, my elves and I have spent a lot of time choosing a proper gift for you. There is just one last thing to remember. Always say ‘thank you’ for your gifts, and please leave out some carrots for Rudolph. I’m trying to stop him eating so many mince pies. I’ll see you soon! Every year I think about the previous winter, and I have to admit that my reindeer Rudolph was right when he said that people can change their ways in just 12 months. Even here, in the Far North, the word has got out that you have made a lot of progress and you deserve some recognition. My closest friends and I are all sitting here by the fire: Rudolph, his nephew Casper, our bookkeeper Maurice the elf, my little helpers Anastasius and Boris, and me of course! We are all very pleased with you. Don't worry, sooner or later your special someone will come to appreciate your efforts too. You must be wondering when exactly that ‘sooner or later' will be? That’s a good question… Well, at least there is always Santa to notice these things. I will definitely remember your development and progress while I prepare the list of gifts for the grown-ups. The elves who have been keeping an eye on you have reported back to me that you have been very grown up on several occasions. I’m very impressed and proud of you. I know that a few people around here have also noticed, and I am certain that this year they will gladly make you feel like a kid again. Ho, ho! I have been watching you carefully this year. So have my elves. They’ve been scribbling down notes to let me know what you’ve been up to. Now, though on the whole you have behaved well, there are just a few things we need to discuss. This year, I’m afraid, you will be getting a lump of coal. In my letters to children, I always tell them to be tidy, to help their parents and to be kind to others. When I write to adults, I like to leave a bit of freedom of interpretation. But in your case, let me be totally clear. Please try better to be tidy, help your parents, and be kind to others. I embrace the fact that shopping is a great way to spend your time, but please be aware that there are other things in life too. Your friends are wonderful people. You might try talking to them without glancing at your phone every minute. They want to see you without it. There is one more thing – I want you to be nicer to yourself. Your friends and loved ones are there to help you, so you can talk to them about your problems. You would do the same for them! Unfortunately, it is impossible to read your mind. So hoping for a clairvoyant will not do any good. Please consider everything I have said for next year, and I will put something special under the Christmas tree for you This year a small lump of coal is a must, but please expect an extra something special as well! I suppose that, upon seeing my stamp affixed to this envelope, you must have wondered why someone like me would remember you. Well, let me elucidate. Have you ever heard of anyone forgetting somebody who owes them money? It’s a similar deal with us, except by money I mean good deeds. Ah, but you might think that no envelope I have for you could ever hold a lump of coal, even a small one. Well, you are right, because it is not needed this year. You have been a good boy! Let me guess, you are delighted with how wonderful you are. 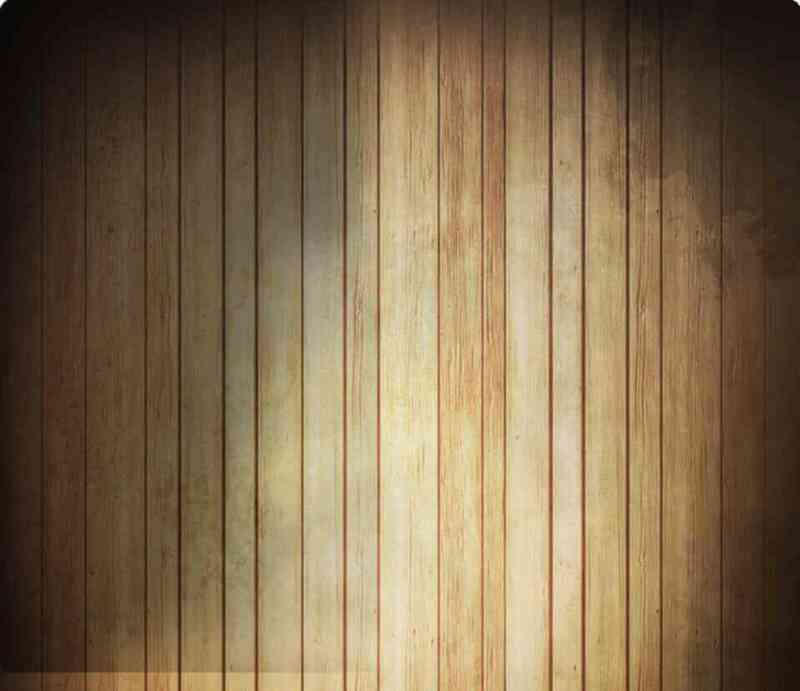 Going back in your memory and recalling all those moments when you were a good man. Very well, but please remember that a clear conscience is the first sign of memory loss. As one of my elves, Eric, has told me, you’ve made a lot of progress this year. Especially in the kitchen department. Now, you are the ruler of the kitchen. Who would have thought that cooking your own meals could be so much fun? You boil water for your own tea; you even slice your bread for sandwiches. Even cleaning is no longer a problem since you have discovered that the plates used to make sandwiches do not need to be washed again. I have to go now, because the reindeer are waiting for their evening training session with the new sleigh. But I hope to carry on this Christmas repartee again soon. My elves are very reliable, nothing gets past them. We have been watching your behaviour this year. It’s not too bad, but I am afraid a few lumps of coal will be necessary. This year we paid close attention to your house chores, for which you could try a bit harder. Don’t worry, you can do it. Shopping for groceries is not the end of the world; your family will appreciate it. Cooking is not as complicated as it sounds, and washing dishes can be quite the meditative task. I know because I have a workshop full of elves and a stable-full of reindeer to clear up after. It’s good to clear your brain once a day at least. So, you have three choices. First is that some of my elves come and live with you to do the washing up. But, they eat a lot more than you think. The second option is that you wait for someone else to do it and you get four more lumps of coal next year. Third, you turn over a new leaf and become the washing up king! I am sure you are thinking ‘Wait, but I also did some good deeds!’ This is true, I saw that and you might get a reward. I am sure you expect lots of presents. If that’s the case, my advice to you is to go do the shopping right now. No need to buy any coal. You have plenty coming your way, free of charge. I imagine you are quite surprised to see this letter from me. You must be thinking, ‘Santa remembers me? I’m the one that leaves Christmas preparations to the last minute.’ You’re right, but this year will be completely different. I’ve written letters to your colleagues and your family to tell them to help you out. Did you know that not long ago I saw you during one of my practice sleigh rides through the sky? I was just about to leave, when I suddenly caught sight of you through your workplace window. I saw that you worked swiftly and diligently, but also that you stayed till the late hours to help your colleagues. You have no idea how happy that made me. I was even ready to slow down and knock on your window to say hello, but then your boss saw me. He waved at me from behind his desk, and then went back to reading Harry Potter. I think that you deserve a reward this Christmas, but you also need to take some time for yourself. Working hard is good, but it can develop into working too much. I hope that after reading my letter you will finally find some time for yourself. As soon as I find my best elf-chef, a true master of Christmas cuisine, I will send her to help you out. In the meantime, your friends and family will stand in for her. All your Christmas preparations will be done in no time. As I have finally managed to get your address, I decided to write to you straight away. You must admit that it has been a while since you were that little boy waiting for me at the door and listening for my footsteps. Do you remember your face when I appeared at your house for the first time? Oh, that was such a wonderful smile! No? Well, you are much older now, and you have probably forgotten that it’s me who brings the presents. I recently received a list from your boss of all your achievements at work. I have pretty good relationships with bosses; it helps me keep tabs on all the kids who have grown up forgetting me. You thought that nobody appreciated your efforts. You could not have been more wrong! I even wondered if I should hire you to help me out up in Lapland. I talked to your boss, but in the end we decided that even a jug of honey and free skiing lessons would not be enough to get you here. When you were younger, your expectations were much lower. The elves are working overtime to finish packing your parcels, and they will be soon on their way. I really cannot understand all this Christmas fever. Should it not be a time of leisure for you all? I’m the one doing all the work! Anyway, I am certain that Christmas will be very special this year. What a wonderful Christmas that was! Now I can finally get some rest and enjoy the sun. Rudolph is with me right now on the Hawaiian sands, which are nearly as white as snow. We have been sunbathing each day from dawn till dusk and coming up with whacky new toy ideas for next Christmas. Rudolph spends his time running around on the beach and surprising the tourists. The elves are trying to build snowballs out of sand, but it’s not going well so far. In the evenings, we drink coconut water talk deep into the night about our favourite sleigh rides. As you already know, I visited thousands of homes to give away of presents to all the well-behaved children. I hope you liked the ones that I brought for you this year. The elves tried very hard to ensure that everything was in order. We were happy to hear from your parents that you had a big smile on your face when you opened them. Please remember to be good next year, and we will visit you next Christmas too! How to create a letter? After you choose one of our templates you can edit if freely by writing something on that letter. You can add a note at the end or delete the whole text and provide your own. Attention: you can't copy&paste a text from your PC. It can be added only by writing on it. E.g. PS Ms. Ann told me, that you're doing great at school! E.g. I see you've made great progress in football! E.g. I heard you was at the sea this year and you like it very much! Buy now. Personalise or give as a gift anytime. Amaze your child, your nieces and nephews, your colleagues, your friends and your loved ones with the unique gift of a personalised letter from Santa Claus himself. So whether you’re looking to thrill a young child or amuse a grown-up, these fun Lapland letters will make for a memorable Christmas. 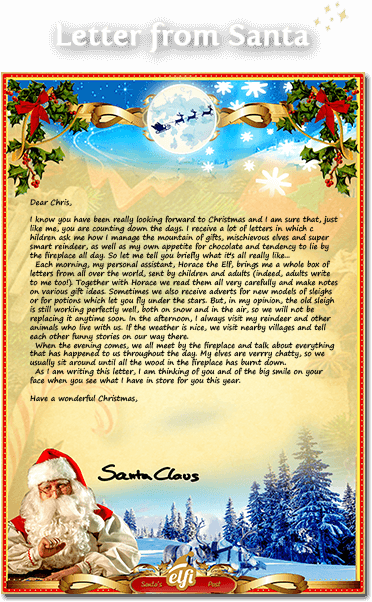 For a long time we’ve had special access to Santa, making us just the elves to provide you with a personalised letter. And it’s free, too! We can even make a unique personalised video from Mr Claus, to really bring Christmas to life. So why not spread some love and happiness this year, courtesy of Santa Claus himself.